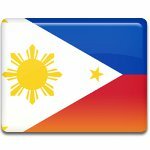 National Flag Day in the Philippines is celebrated on May 28. It commemorates the first use of the Philippine flag after the victory in the Battle of Alapan in 1898. The current national flag of the Philippines was created by the Filipino revolutionary Emilio Aguinaldo in 1897. It is a horizontal bicolor of royal blue over scarlet red. There is a white equilateral triangle at the hoist with a golden sun with 8 rays in the center and a 5-pointed gold star at each vertex. The flag was first raised after the Battle of Alapan that occurred on May 28, 1898. The battle was fought between the Filipino revolutionaries led by Aguinaldo and Spanish troops. The Spanish were defeated, and the revolutionaries recaptured the province of Cavite. After the battle, Aguinaldo entered Cavite City and unfurled the would-be national flag for the first time. Flag Day in the Philippines is marked with the raising of the national flag. The flag is permanently displayed from May 28 to June 12 (Independence Day) by all government offices and agencies, businesses, educational institutions and private residences. In recent years, the flag days have been extended until June 30 to celebrate the country's independence and promote patriotism.